Tamler Sommers is a professor at the University of Houston who has been active in the experimental philosophy movement. He is author of A Very Bad Wizard, a collection of interviews with moral philosophers and psychologists, which was an offshoot of his podcast with David Pizarro, Very Bad Wizards. 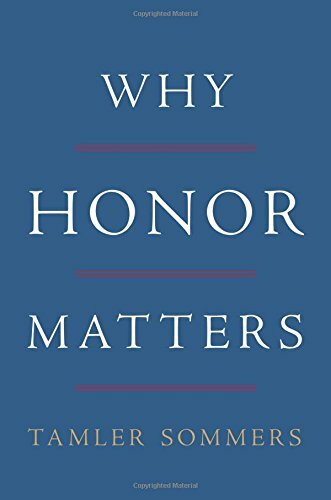 In his new book, Why Honor Matters, written for a trade publisher and aimed at a general readership, he makes a case that it is worth promoting honor as a virtue. Sommers himself reads the unabridged audiobook version of the book, and delivers a strong dose of conviction and warmth in his performance. Sommers tends to make consequentialist arguments for the importance of honor and honor cultures. He argues that the common arguments against honor are mistaken, and when understood properly, honor cultures give meaning to life, are better for happiness, and are good for society as a whole. He does not rule out combining honor as a virtue with other approaches to moral life, and he acknowledges concepts such as universal rights. His main point is that a morality that is dominated by a liberal approach that highlights human dignity is not sufficient for our purposes in the contemporary western world. He is impressed by the complexity that honor brings to ethics and its ability to adapt to different contexts. He welcomes that it places less emphasis on the distinction between what is and what is not within our self-control, and focuses more on what we do. He also embraces the importance of dishonor or shame as a way to regulate behavior. He gestures at modern problems in society, such as shamelessness, rampant individualism and aversion to risk. He argues that community is important and an honor culture acknowledges this far more than a liberal culture. Part of Sommers' task is to explain what an honor culture is, and he turns to familiar examples from sports, the military, gangs, literature and the movies. He also uses some anthropological theory and Ancient Greek culture to explain subtleties about kinds of honor, its obligations and responsibilities, and what is useful about it. Throughout the book, Sommers brings in studies from psychology, sociology and other areas to illustrate and back up his claims in defense of honor. It is impossible to argue that all honor cultures are always for the best, and Sommers does not try this. Rather, his goal is to show that honor cultures do not necessarily have the problems often attributed to them, and generally they can be better than alternatives. While we may think of honor cultures as associated with violence, sexism, and even racism, Sommers argues that they can be good at containing violence and promoting equality. At various points, Sommers appears to move beyond merely consequential arguments for honor cultures. He sometimes argues that they simply make better sense of our time worn moral practices and our associated intuitions. For example, he argues that the desire for personal revenge on someone who has hurt us or someone we love is important because means a lot to us. It is also something that neither retributivism nor utilitarianism take seriously enough, treating it as a primitive vestige of a morality that we would be better to forget. Sommers argues that we should pay attention to the victims of wrongdoing. He brings in an extended discussion of restorative justice, and argues that this does a much better job of matching our moral intuitions than alternative approaches. To link honor cultures to restorative justice is a little surprising, and it is rare to see this connection explicitly drawn in defenses of restorative justice, which are normally given in more consequentialist terms, and use phrases such as criminals taking responsibility for what they have done and breaking cycles of punishment perpetuating criminality. Sommers makes a convincing case that paying attention to the victim and achieving resolution after a crime through restorative justice not only delivers better results, but also fits better with our fundamental moral intuitions of what it means to hold someone responsible for their actions. Why Honor Matters is well-written and should be of interest to anyone interested in modern ethical debate. The main gap in it is regarding shame. Honor and shame are intimately related. Indeed, honor cultures and shame cultures are generally just different ways of referring to the same thing. These days, shame is regarded as corrosive by a lot of modern psychology, and we are often told that to shame someone is a terrible act. Sommers briefly argues that fear of shaming can be useful as a way to reduce bad behavior, but he never explicitly addresses the worry that it will undermine the mental health of society to embrace the shaming of people. His discussion of restorative justice suggests that shame can be appropriate and victims do want those who hurt them to be ashamed of what they have done, but that still leaves the wider role of shame in everyday life.